Patient with osteoarthritis may complain of pain of the joint and stiffness of the joint which worsen with excessive used. Osteoarthritis commonly affecting the knee joint, hip joint and lumbosacral spine joint, distal interphalangeal joints of the fingers and proximal interphalangeal joints of the fingers. There will be Bouchard nodes and Heberden nodes. Patient often consider medication such as NSAIDS. Osteoarthritis is associated with mechanical trauma to the joints. It is known as wear and tear arthritis due to destruction of the articular cartilage. 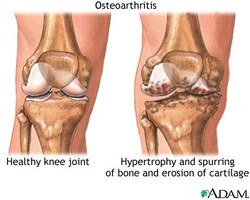 Osteoarthritis may occur with formation of osteophytes. Osteophytes are the growth of the new bone at the articular edge. The osteophytes may be fractured and floated in synovial fluid. One bone may rubbing another bone which lead to polishing of the bone or another term known as eburnation of the bone. The joint cartilage may also flakes off. Cystic degeneration may present. Surgical replacement of the joint is considered as the final option in severe case of osteoarthritis.